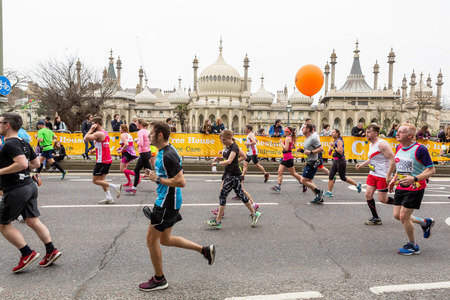 The Brighton Marathon was founded by former international athlete Tim Hutchings and by former Brighton club athlete, Tom Naylor. The event is organised by the Grounded Events Company ltd. The first running of the race took place on 18th April 2010. Since its inauguration, the Brighton Marathon has grown dramatically to become the Brighton Marathon Weekend. The course bests for the men and women are well under 2hrs10min and 2:29, making it the second-fastest marathon in the UK. It is also the second-largest marathon in the UK and eighth-largest in Europe. The Brighton Marathon Weekend kicks off at the Event Village on the beach, which is located next to the Finish Line at Madeira Drive. On Friday 12th and Saturday 13th Race Pack Collection will take place here as well as a range of things to see, do and buy including talks with the experts, pre and post-race massage, retail, food, bars and live screens. It's free to enter, so friends, family and the local community can all come along and enjoy the atmosphere. On Sunday 14th April (Race Day), the Event Village will become a hive of activity and celebration as runners reunite with friends and family and enjoy the live footage, eating, drinking and fantastic atmosphere.